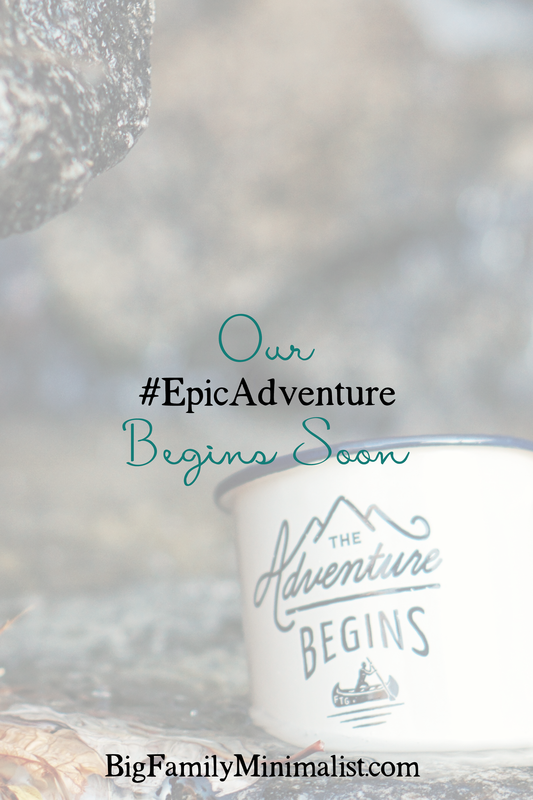 In the very near future, our family will be embarking on what we lovingly call ou #EpicAdventure. We are trading in our 3000 sq ft home in the ‘burbs for a 32-foot travel trailer and we’re off to see the country. I can’t tell you when this crazy idea really came to us, but I can tell you precisely what overpass we were driving over when Josh said: “let’s go look at RVs.” And that was the moment we started planning this crazy thing we’re about to do. That was back in April, and things have been a little crazy ever since. When we started planning, we were thinking we’d set off in May or June of 2018. We thought a year was the perfect amount of time to get the business shifted to something that was manageable from the road, save up, research and buy a rig and tow vehicle, and really have a plan for where we’d be going and what we’d be doing. The thing is, we really didn’t start telling too many people about it because we knew they’d think we’re absolutely nuts. I mean, we’re a big family, and we want to give up the big, beautiful house we just bought and cram ourselves into a tiny trailer?! In late-July, we finally told our first family member–Josh’s mom. She’d flown up to visit for a week like she does every once in awhile, and the kids could not wait to tell her! We thought that nine months was some good lead time for the family to start making the mental adjustments that we were really doing this. The very next day, Josh was laid off from his job. We didn’t expect that, and I think that under any other circumstances, that would have sent us into an absolute tizzy. But the groundwork was already laid. I’d recently had a real estate agent over to give us an idea of what we’d be getting into when it was time to sell our house. After touring many, many rigs, we’d recently decided to downsize our dreams of a 5th-wheel to go with something light enough to pull behind a vehicle that can seat seven rather than try this lifestyle with two vehicles. We’d recently started researching what vehicles would meet those towing and seating requirements. So we forged ahead. We got the house on the market, we sold or donated 80% of our belongings (closer to 90% of our furniture, actually). With the help of Josh’s dad, we said goodbye to our minivan and hello to a Ford Expedition with a heavy duty towing package. We put a deposit down on a travel trailer. Three months later, and the house still hasn’t sold. In our neighborhood, that wasn’t expected. At the time we listed, the average listing-to-accepted-offer timeline was about two weeks…and we had prepared ourselves to get out in a hurry. We actually moved our whole family into the finished basement because we sold all of the furniture and it was just easier to keep it clean this way. But then we waited, and we waited, and we waited. So what’s the moral of this story? When you have a crazy idea and you want it to be your reality: DO THE WORK. If we had said “yeah, that’ll never happen in the next year” and shoved our idea up on a shelf, we would have been up a creek without a paddle when Josh got laid off. Yes, that wasn’t how we’d hoped to do things, but because we’d already done the work, we were a lot less stressed about the whole situation. It actually felt like the Universe was giving us a swift kick to get started. Doing the work isn’t glamorous, but it sure paid off. We had already sold one business and begun closing down another so that we could make the transition. We’d made decisions about a lot of our belongings before the stress of the layoff ever entered the picture. We’d prepared the kids for this lifestyle from a place of abundance and joy, not scarcity and fear. Doing the work allowed us to control our circumstances far more than we could have if we’d shelved the dream and then picked it back up out of desperation. Over the next few weeks, I’ll be sharing more about the mindset changes that led us here and more of the practical things that have gone into the planning and downsizing to prep for our #EpicAdventure. Have you ever considered a nomadic life? If so, what’s kept you from pursuing the dream?